Ah, the weekend – time to catch up on work, but mostly cook and write the first post for your new food blog. Thank you to everyone who gave me their input and helped me decide on Sprig and Flours. Special thanks to Alyanna for giving me a good laugh by suggesting “Food Conniesseur”. 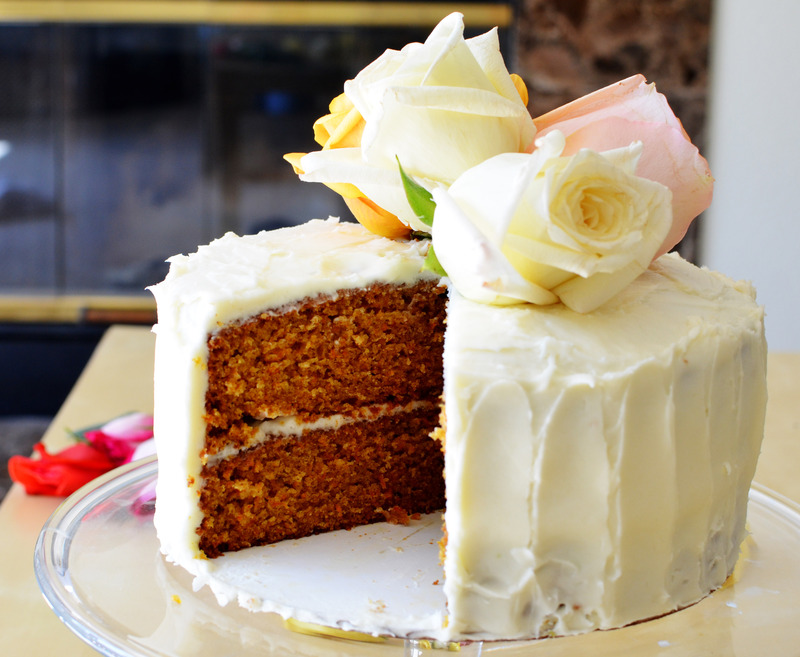 Because Easter is on Sunday, I decided to make carrot cake – I like to be a little festive. Ok, a lot festive! 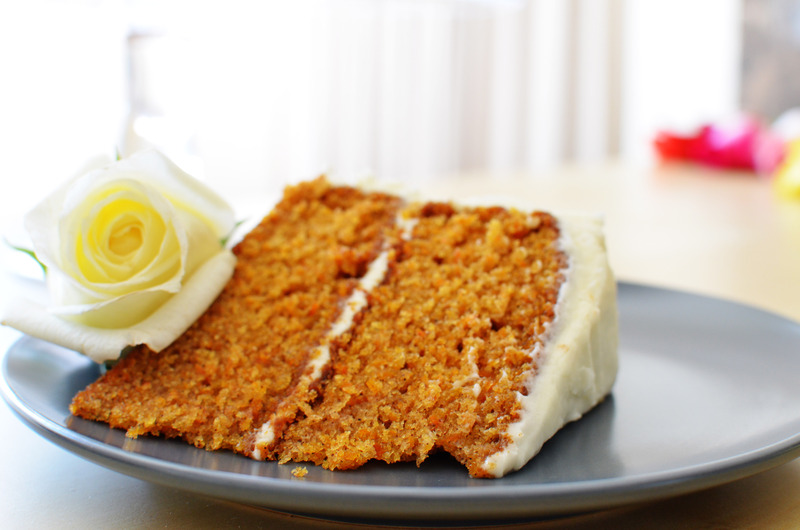 This carrot cake recipe is amazing. I’m talking 4.0 student with 20 extracurriculars and 4 jobs amazing. This recipe technically serves 8 people, but it’s so good – I could probably polish it off myself. But I won’t. Because I have self-control. For the most part. The cake is extremely moist and soft. The frosting is fluffy and light. Together, they make the best carrot cake I have ever had. You’ll need 3 cups of grated carrots, which is about 3 – 4 carrots (depending on the size of the carrots). Use the side with the fine grating surface. If you missed your arm workout for today, fret not – you’re about to get it grating these carrots. Mix together all the wet ingredients. If you think grating the carrots wasn’t enough of a work out, you can do this by hand. Sifting the flower flour (I’m afraid this blog name is going to give me phonology-orthography problems) and other dry ingredients help make the cake lighter and less dense. 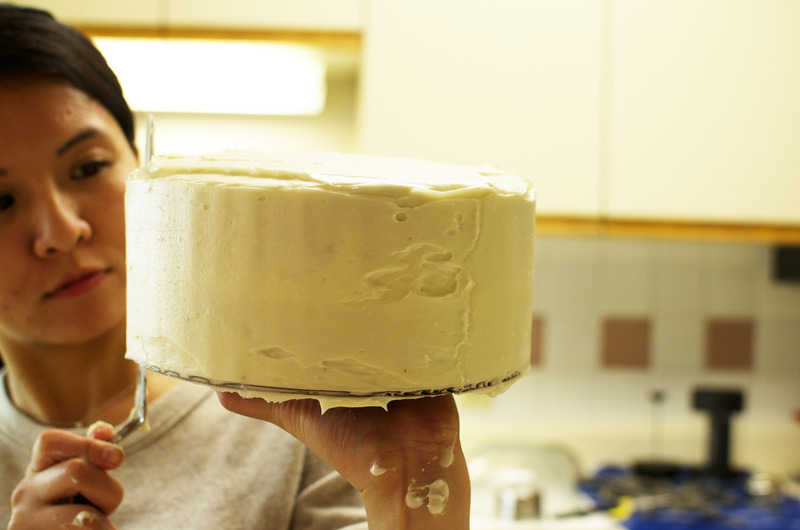 Let the cake cool completely before frosting. I struggled with this step a lot as a kid …and who am I kidding, as an adult too. I’m working on it – I promise! In the meantime, you can keep yourself busy by creaming together the softened butter and cream cheese. When it’s nice and smooth, add the vanilla. When the cakes are completely cooled, frost away! Eventually, you will get something that looks like this! I used a frosting spatula to make this “rustic” look. Hold the spatula vertically down and gently press it on the cake. Slowly, slide the spatula up along the side of the cake. Continue this around, placing the spatula right next to last mark. Careful not to make big peaks around the top rim of the cake. This design looks nice (and is much easier to do) when there’s a lot of frosting on the cake. 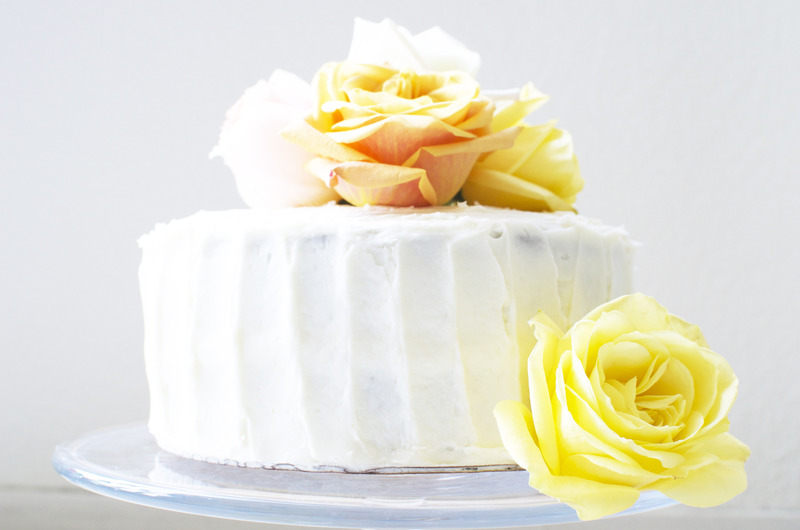 Finally, I decorated this cake with fresh cut roses! It looked and smelled so wonderful. 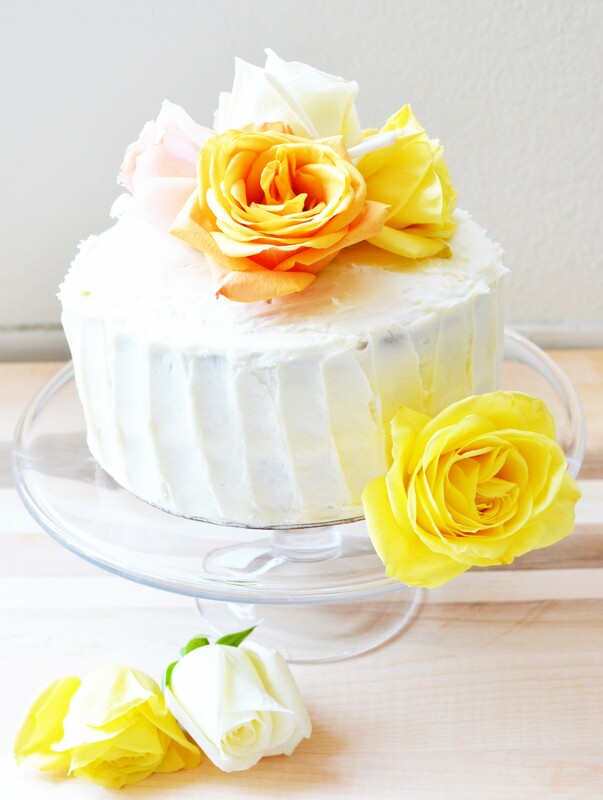 Cheers to the inaugural post of Sprig and Flours! Butter or spray two 8" cake pans. You can use any cake pan you like, just adjust the cooking time. Line the bottoms of the pans with a circle of parchment paper. In a large bowl, mix together the eggs, canola oil, brown sugar, white sugar, and vanilla extract with an electric mixer. Beat for 2 - 3 minutes, until smooth. Set aside. In a separate large bowl, sift the flour, baking soda, baking powder, salt, cinnamon, and nutmeg. Stir to combine. Gradually, add the wet mixture and grated carrots to the dry mixture. Mix on medium speed until evenly incorporated, but do not over mix! Evenly distribute the batter between the two greased cake pans. Bake for about 35 minutes or until a toothpick inserted in the center comes out clean. In a large bowl, cream together the butter and the cream cheese with an electric mixer. Whip on high speed for 1-2 minutes, then medium speed for about 3-4 minutes. Scrape the sides of the bowl, then add the vanilla extract. Mix on medium speed until incorporated. Add the powdered sugar, and gently fold in by hand with a spatula until it's mostly combine. With an electric mixer, finish the mixing on medium speed, until the frosting is nice and smooth. Frost the cakes when they have completely cooled. If you want that rustic look, hold your frosting spatula vertically down and press it on the cake. Gently, slide the spatula up along the side of the cake. Continue this around, placing the spatula right next to last mark. Careful not to make big peaks around the top rim of the cake. You can just smooth the peaks down if they're there. This design looks nice when there's a lot of frosting on the cake. Instead of 1 cup canola oil, you can substitute it for ¾ cup applesauce and ¼ canola oil. This entry was posted in Desserts & Sweets and tagged cupcake & cake. So happy n proud of u!! Connie, I love it! The pics are so professional looking and the way the items are presented in the pics makes it look so nice. Keep up those recipes! Connie, the cake was SOOOO amazing! Thank you for sharing it with us!! Thank you so much! Please let me know what you think of the recipe! You are *TOO* sweet!!! Your taro dish looks and sounds AWESOME!! Thank you *so* much for alerting me to this mishap! (You are definitely not losing your mind!) I made some changes to my recipe cards last month, and for some reason, a couple of my earlier recipes didn’t correctly transfer over. I thought I caught all the errors, so thank you again for letting me know!!! Hi Ally!! Thank you so much for letting me know! I am so happy you enjoyed the recipe(: What a great idea to do mini cupcakes! I could definitely go for one right now! cream cheese to dilute the 3 and a half cups of sugar. Next time, I may just add 1 and a half cups of sugar. And, make sure the cream cheese is room temp before mixing. Overall, it’s a really good recipe! Thank you! I wanted to post a pic of my end result, but didn’t know how.